A Guide To Shower Tray Sizes & Styles – Which Shower Tray Should You Choose? With so many shower tray sizes and styles on the market it’s hard to make an informed decision on which you should choose. In this blog post we discuss all the important factors that might sway your choice including the shape, construction material, brand, height, colour and waste size and position. There are numerous shower tray sizes available on the market, together with shape this will probably be your first consideration. This will be dictated partly by the space you’re installing into and the shower door or enclosure you have chosen. The most popular shapes are rectangular, quadrants and square fitting into both corner and recess spaces. Less popular but attractive nonetheless are oval and pentangle and offset pentangle designs, creating a 5 sided showering space. Larger showering spaces will require rectangular or walk in style shower trays whilst smaller showers for an en-suite might employ a small quadrant or square design. In terms of rectangular sizes there are few on the market that are 1300mm on the longest side. MX do offer them in their Elements range but can prove difficult to get hold of as not many manufacturers produce shower doors in this size. To future proof your tray which will probably outlast your enclosure choose a popular size that lots of manufacturers make trays in. Indeed those looking for replacement 1000x900mm offset shower enclosures to match their existing installed tray are having a tough time. If you require bespoke sizes or relatively rare sizes have a look at what Bette have to offer. 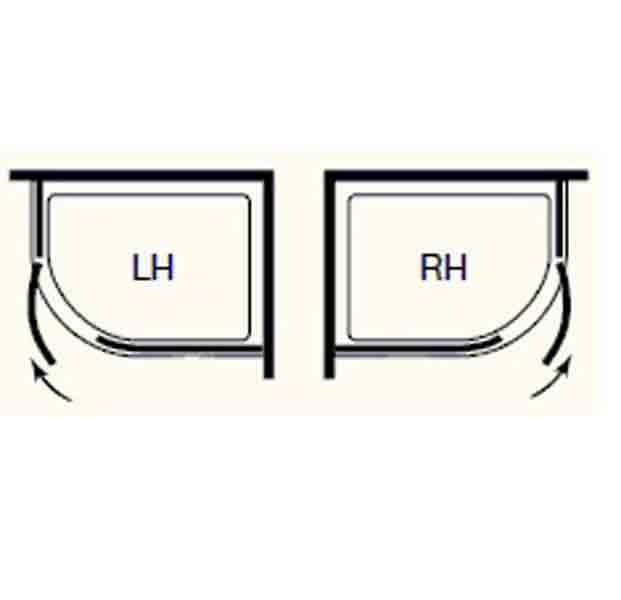 When it comes to shower trays nothing causes more confusion than the handing of an offset quadrant. Indeed try explaining this to someone over the phone, it’s almost impossible. We won’t try explaining it here either you’re better off viewing the diagram below and the penny will drop. Until this was added to all our offset tray products returns were frequent. When choosing a shower tray as well as size one of your primary decisions should be made on the construction material. Traditional high walled shower trays tend to have a stone resin or ceramic construction, with a few newer models such as the MX Classic range incorporating a gel surface which makes them slightly warmer to the touch. This gel coat also allows manufacturers to incorporate non slip tread patterns. As far as construction goes these trays once sited will last a lifetime. However getting them there and fitting can be awkward due to the heavy weights involved often taking 2-3 men to lift with larger shower tray sizes. Indeed many retailers have stopped offering high walled stone resin trays in the larger sizes. So if you choose one of these shower trays you should also be prepared for higher delivery costs as a palletised or two man delivery will likely be required. In summary they’ll last a lifetime but might be best for ground floors! More popular these days are sales of resin mix shower trays. These incorporate a mix material which differs between manufacturers. Ultra’s Pearlstone shower tray range for instance uses a mix of resin and volcanic ash. This results in a lighter tray than with solid stone versions. Yet the tray retains strength and a feeling of robustness, giving a firm foundation for showering. These trays are usually more low profile in design with heights of 35-60mm. This more modern look seems to be more desirable to those wanting to create a minimalist look and feel. They also have flat undersides allowing them to be positioned easily without any kind of wooden plinth yet they can still be raised with an easy plumb kit. The Pearlstone tray construction for instance has good screw retention. If you’re interested in this kind of tray as well as the Ultra Pearlstone range also consider the MX DuraStone range and the Mira Flight range. ABS shower trays have previously been judged as the poor relation in the shower tray world but there are some fine examples on the market. The relative lightness of ABS trays makes them easier to organise delivery for from a retailer perspective. For fitters and consumers it makes them easier to handle and to put into position. Despite their weight they are still very strong with many models such as the MX Elements range also incorporating a hollow section metal reinforcing bar to add further strength and rigidity to the construction. This particular range and the rebadged Phoenix version of the range can also be used in a raised installation. Ok so there are some poorer quality versions available, these end up spalling and bubbling up with the ABS construction sounding like squelching water beneath you when you stand on them. Pay above £100 for a branded model and you should be fine though. A completely new option to the market is the Softstone range from Just Trays. These are a premium design for a flush to the floor finish. Calling them a tray seems a little odd since the surface is anything but tray like, a shower base might be a better description. The surface is soft and slightly spongy to walk on yet looks like it’s made from an organic slate material. This surface is both non-slip and anti-bacterial. Currently the range is available in 3 colours, white, black and cream as well as lots of sizes including bespoke offerings. It’s a great looking solution and feels great underfoot but fitting takes a little longer given all the supporting layers that are required. Checkout the video below which will help to explain the product better. It’s simple if you want a shower tray that will last a reasonable length of time and will look the part then always choose a branded tray. For less hassle should a guarantee claim be made choose a bigger brand or perhaps even a British brand. On your short list should be MX Shower Trays (Milton Cross), Mira, Ultra Finishings Pearlstone, Just Trays as well as those from household name Twyford and the uber high end Bette. Deep Shower Trays Or A Low Profile Design? The height of the tray is one of the main purchasing decisions as it has numerous implications for style and accessibility. For an ultra modern installation go low profile. There’s plenty of choice on the market with the MX Optimum a particular favourite at only 25mm high. These can also be installed inset to the floor to create a seamless surface giving more affordable wet room style finish that is also supremely accessible. High walled deep shower trays aren’t exactly the most accessible design yet they remain popular. They’re robust, puddling water is unlikely to overflow and they create a more secluded, robust environment. The MX Classic and Mira Flight represent good options if this is the style of tray you require and many incorporate decorative non slip tread patterns for safety. 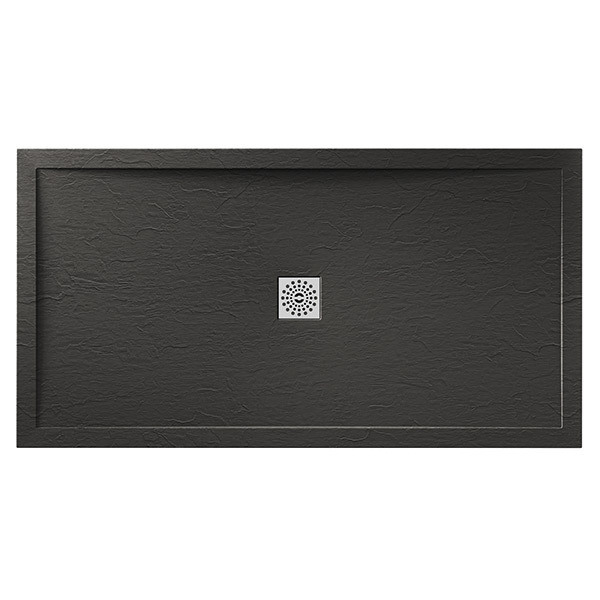 It’s worth noting that some sizes of MX classic tray have a fairly long lead time, think pentangles and some not so popular rectangle sizes such as 1000x900mm. Manufacturers will be limited by storage and put the majority of their efforts into the bread and butter sizes that sell all day long. In that respect we’ve found the Aquaglass+ trays will fill the gap as a good alternative, although they are only 80mm high as opposed to 100mm. It used to be that shower trays were available in every colour so long as it was white. Only recently have alternative colour options come onto the market, well certainly at prices we can all afford. The likes of Aquaglass+ introduced their slate coloured as well as natural looking patterned trays. 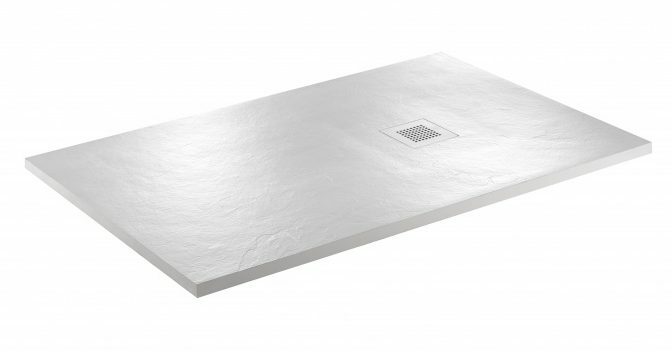 Aquatech have also got in on the act being one of the first companies to introduce a slate effect shower tray in quadrant and offset quadrant shapes. They still do the rectangular and square varieties too. They’re also available in an anthracite or white finish and for the price they look amazing. While Mira have introduced 3 new contemporary colours including taupe, titanium grey and grey anthracite to their range of Flight Safe Trays. 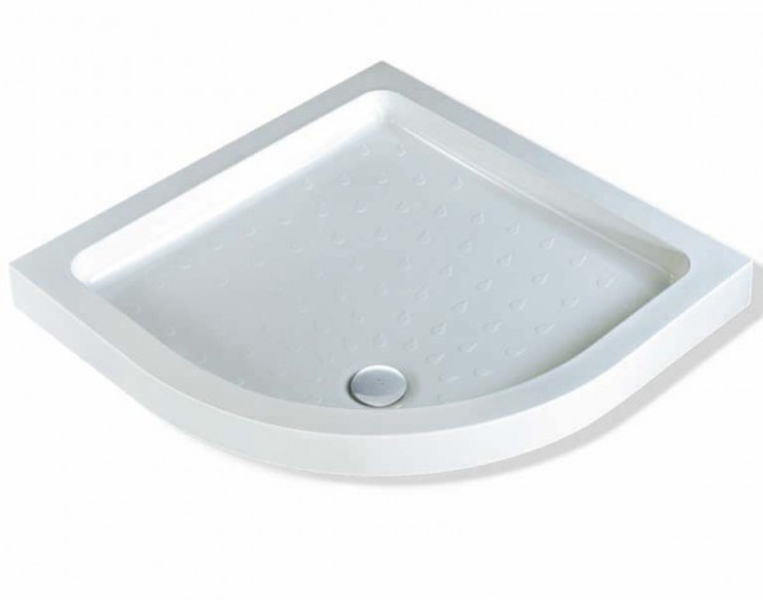 Just Trays have gone even further offering all manner of colours and finishes to some of their shower tray ranges. The Evolved range includes 5 unique colours as well as matt and gloss white. How about a Sage Green, Pastel Blue or an Astro Black shower tray? Just bare in mind what is today’s contemporary colour of the moment could be tomorrows avocado bathroom suite! Does Shower Waste Size Make a Difference? In recent times the standard size for a shower waste has been 90mm to fit the hole incorporated into most manufacturers shower trays. This large waste hole is perfect for draining water away quickly, this is especially true with low profile trays where you want to avoid puddles forming and making the surface slippery and unsafe. The alternative circular size is 50mm these are often incorporated into deeper high walled shower trays such as the MX Classic range. 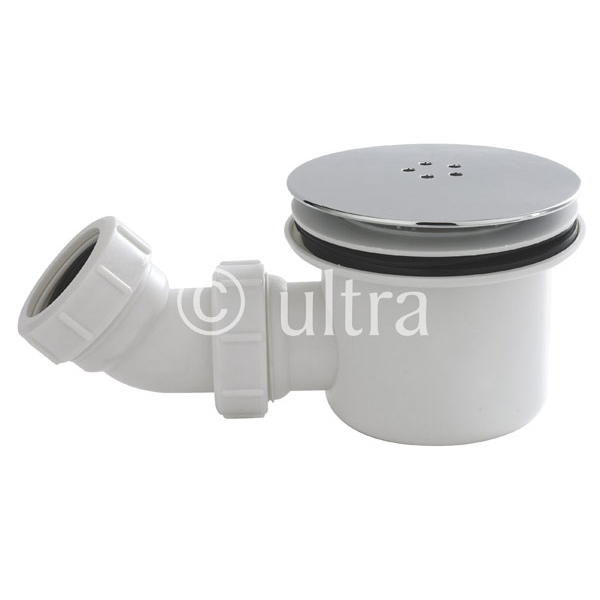 The larger design is clearly better at getting rid of water furthermore most models have a removable top cover cap and waste trap to catch hair and debris before blocking more difficult to reach pipe work In your home. Just Trays and MX also offer concealed linear wastes that are accessed via a small colour coordinated rectangular or square panel. This is often located central down one edge. JT specifically emloy a slim waste from global manufacturer Wirquin, these are a high quality solution. Take 2 of the same size trays from different manufacturers and as well as the cosmetic differences you might discover that they also position the waste hole differently. Manufacturers will have their own reasons but from a consumer point of view this choice is a benefit. If you’re not replacing an existing shower tray it would be wise to have a look under the floorboards of your bathroom and work out where a waste hole could realistically go. Some quadrants for instance position the waste front and central, others to the back corner and others to the LH or RH side. As long as you do the preparation you can make an informed choice. Some manufacturers even have templates available that you can print out and place in situ prior to purchasing the actual product. If you’re installing a tray raising kit the waste position will be less important as you’ll have more space to route the plumbing to the waste hole whilst providing a natural degree of fall. What Are Shower Tray Upstands? Upstands are the little lips around the perimeter of some shower trays. They can be tiled over or used to place the profile of a shower frame up to. It’s a simple idea that because water finds it difficult to travel uphill these lips will provide a more watertight space. Depending on the space you’re fitting into and the choice of shower screen you can choose trays with 0, 2, 3 or 4 upstands. These can help prevent costly work as a result of water leaking down the back of shower trays. The alternative to upstands is a bead of silicon to marry the wall surface to the tray and create a watertight space. Got a concrete floor? Then more than likely you’ll need a tray raising kit. This will add around 100mm to the height of the tray with plenty of room for plumbing beneath. Some excellent easy plumb kits, as they’re otherwise known, are manufactured by MX and Pearlstone. Some kits are made specifically for a shower tray range. Others are a more universal design and include a wooden plinth and plastic trims to suit all tray shapes. The legs of a tray raising kit are generally attached to the underside with screws. Some brands like JT though have trays with preformed slots underneath so that the top of the leg can just slide in. This makes fitting easier and quicker. The disadvantage of raising the tray is that it makes it slightly less accessible in terms of a shower due to the height. On the other hand if you should have any issues with plumbing such as blockages, accessing pipe work won’t be a problem. Bathroom safety is obviously very important particularly where bare feet and wet surfaces come into contact. For those where safety is a little higher up the list of priorities perhaps with young or elderly users there are numerous suitable products on the market. Many of the MX tray ranges include tread patterns to create a non-slip surface. Other manufacturers do this differently. Phoenix have incorporated a grooved drying area in their walk in tray range which creates a safe and dry zone once you leave the wet showering area. The Mira Flight Safe range does things differently still by incorporating a non-slip coating. It’s perhaps not as effective as grooves or a raised tread pattern but it does offer at least some slip resistance without impacting the look of the tray. A relatively new development in the shower tray market is the manufacturers application of an antibacterial coating. Mira calls this BioCote a translucent surface coating that will reduce bacteria and mould growth by up to 99.9%. This is a pretty exciting development for those in shared accommodation or in hotels and guest houses. No more catching verrucas in that shared student house. It also means the tray will retain its pure white finish and won’t become discoloured with mould growth. 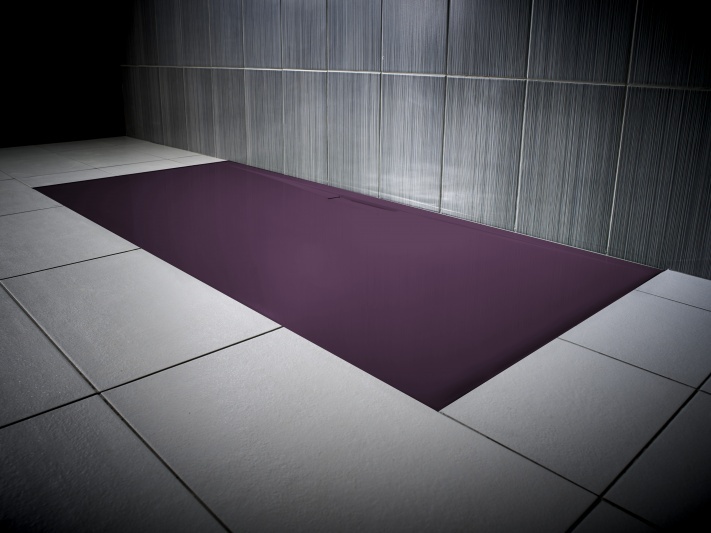 BioCote has been incorporated into all Mira Shower Trays. Other manufacturers like JT have their own equivalent solution. So hopefully you should now have a fuller understanding of what to consider before choosing a tray. Shower tray sizes are just the tip of the iceberg. Equally important is the tray construction for your particular bathroom setting as well as brand and whether you require an easy plumb kit. Planning is paramount. What Are The Best Shower Trays ? We’d love to tell you that there is a range of shower trays that includes all the best features discussed above and is affordable and available in plentiful supply. The fact is that it’s a horses for courses situation. If you want a unique colour for a high end space then go for the JT Evolved range. For deep trays with bomb proof construction it has to be the MX Classic. The best all rounder however has to be the Mira Flight. Well constructed, reasonably affordable and available with some great safety features such as non slip and anti-bacterial surfaces. 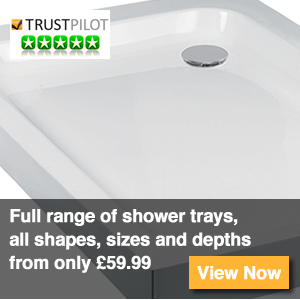 Take a look at the full range of shower trays.